Mr. and Mrs. Werner E. Josten, New York. The Museum of Modern Art, New York (gift from the above in 1957); sale, Sotheby's, New York, 15 November 1989, lot 55. Cahiers d'Art, Paris, 1957, p. 44 (illustrated). C. Zervos, Pablo Picasso, Paris, 1966, vol. 17 (Oeuvres de 1956 1957), no. 58 (illustrated, pl. 25). D. Cooper, Picasso--Theatre, New York, 1987, p. 359, no. 423 (illustrated). Paris, Galerie Louise Leiris, Picasso: Peintures 1955-1956, March-April 1957, pl. 23 (illustrated). New York, The Museum of Modern Art, and Chicago, Art Institute, Picasso: 75th Anniversary Exhibition, May-December 1957, p. 113 (illustrated). Philadelphia, Museum of Art, Picasso: A Loan Exhibition of his Paintings, Drawings, Sculpture, Ceramics, Prints and Illustrated Books, January-February 1958, p. 24, no. 259 (illustrated). New York, The Museum of Modern Art, Picasso in the Collection of The Museum of Modern Art, February-April 1972, p. 179 (illustrated). Purchase, New York, Neuberger Museum, and Houston, Contemporary Arts Museum, The Window in Twentieth Century Art, September 1986-June 1987, p. 102 (illustrated, p. 85). Paris, Muse National d'Art Moderne Centre Georges Pompidou, and London, Tate Gallery (no. 8), Late Picasso: Paintings, sculpture, drawings, prints 1953-1972, February-September 1988, p. 157, no. 11 (illustrated in color). Stockholm, Moderna Museet, Pablo Picasso, October 1988-January 1989, no. 81. 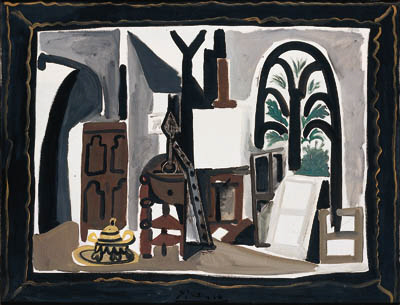 Studio in a Painted Frame, is, I believe, the finest of Picasso's series of recent  paintings of the interior of his villa at Cannes. In it the artist has transformed the fantastic, through functioning, disorder of his studio into a beautifully controlled design suggesting at first glance his decorative late Cubist style. Yet once one has seen the room itself, the objects in the pictures are easily recognizable: the tall, heavily-mullioned window with the palm tree beyond, the squat brass stove from North Africa, his bronze bust of a woman with the diamond-shaped face, one canvas on the easel ready for work and others scattered about on the floor, leaning every which way. This painting has been requested for the exhibition Picasso: The Artist's Studio, to be held at the Wadsworth Atheneum, spring 2001, and the Cleveland Museum of Art, fall 2001.